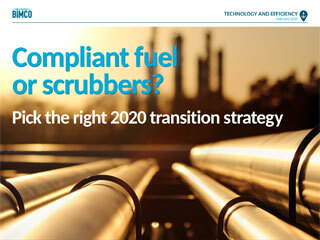 Compliant fuel or scrubbers? 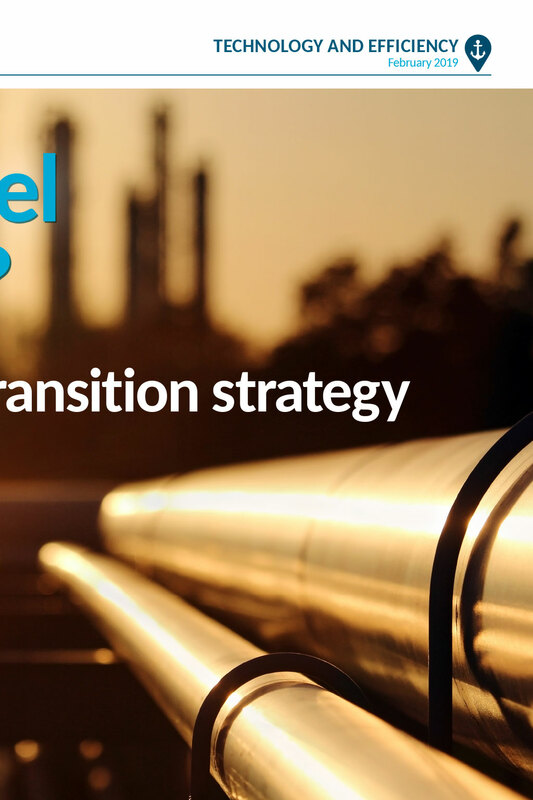 Pick the right 2020 transition strategy Implementation of the IMO’s 0.50% sulphur limit for fuel oil is presenting one of the most significant challenges to all stakeholders in the marine fuel oil market – from producer to user. The transition period has started; decisions must be made, and implementation plans need to be drawn up. 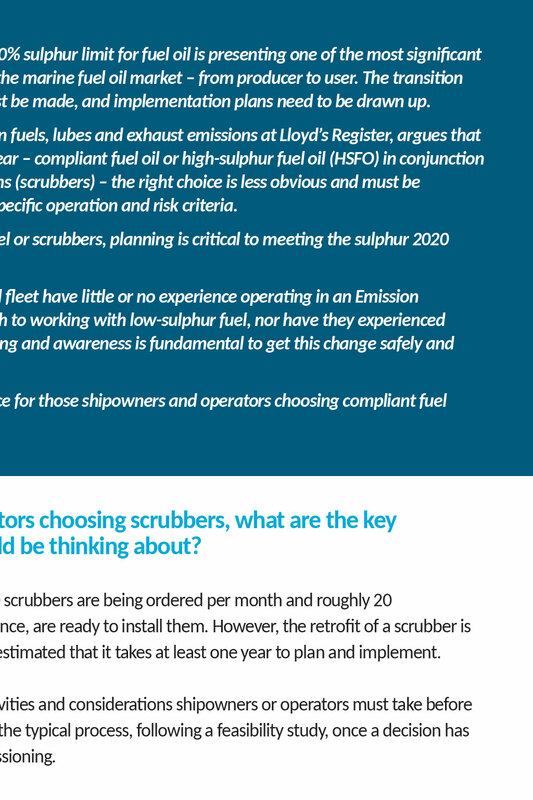 Tim Wilson, Principal Specialist on fuels, lubes and exhaust emissions at Lloyd’s Register, argues that while options at this stage are clear – compliant fuel oil or high-sulphur fuel oil (HSFO) in conjunction with exhaust-gas cleaning systems (scrubbers) – the right choice is less obvious and must be evaluated based on each ship’s specific operation and risk criteria. 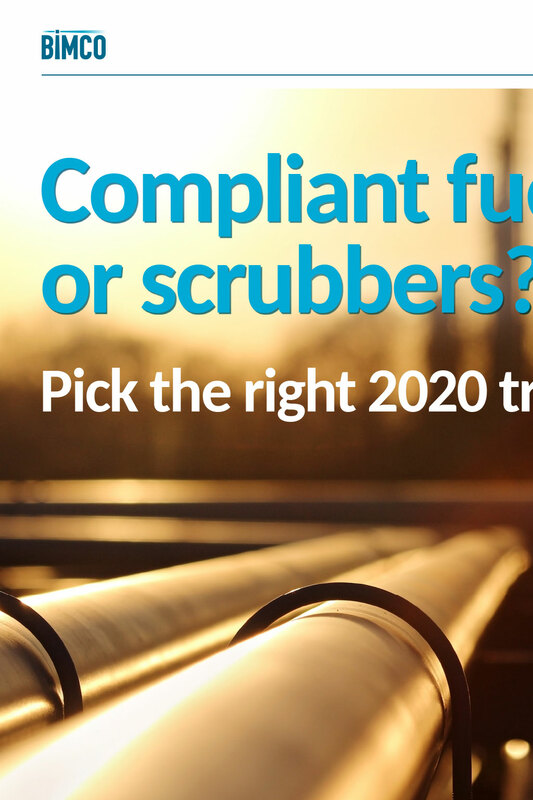 “Whether choosing compliant fuel or scrubbers, planning is critical to meeting the sulphur 2020 deadline successfully,” he says. “Approximately 50% of the world fleet have little or no experience operating in an Emission Control Area and having to switch to working with low-sulphur fuel, nor have they experienced this type of change before. 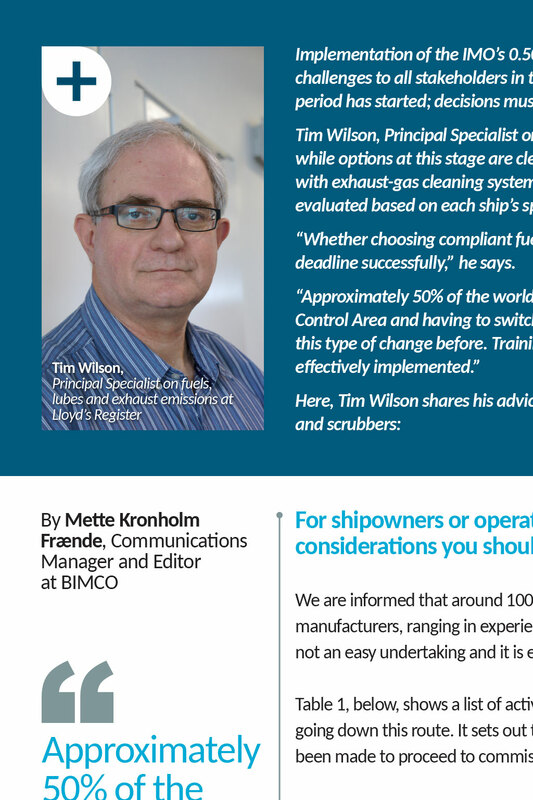 Training and awareness is fundamental to get this change safely and effectively implemented.” Here, Tim Wilson shares his advice for those shipowners and operators choosing compliant fuel and scrubbers: Tim Wilson, Principal Specialist on fuels, lubes and exhaust emissions at Lloyd’s Register For shipowners or operators choosing scrubbers, what are the key considerations you should be thinking about? We are informed that around 100 scrubbers are being ordered per month and roughly 20 manufacturers, ranging in experience, are ready to install them. However, the retrofit of a scrubber is not an easy undertaking and it is estimated that it takes at least one year to plan and implement. Table 1, below, shows a list of activities and considerations shipowners or operators must take before going down this route. It sets out the typical process, following a feasibility study, once a decision has been made to proceed to commissioning. However, it is dependent on ship type and other influencing factors, and the table does not reflect the time needed to consider the feasibility of fitting a scrubber. It is also important to take account of the time the vessel will need to be off hire during the installation, and the associated implications. 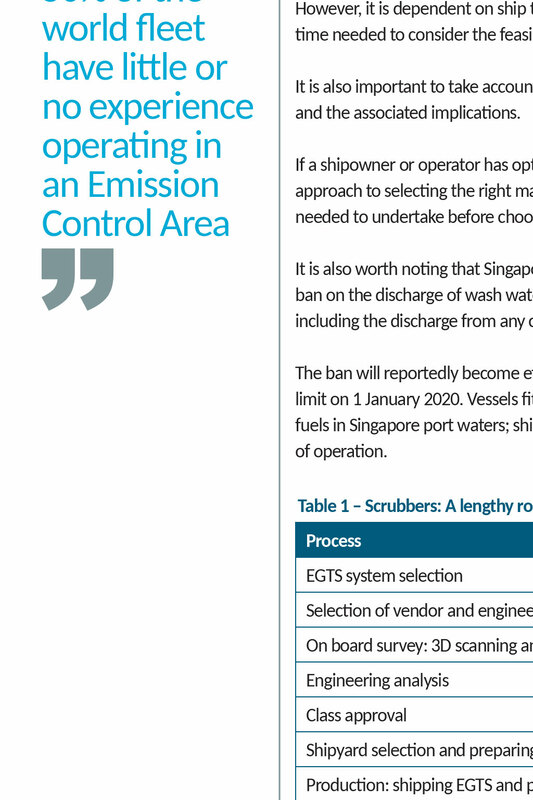 If a shipowner or operator has opted to install a scrubber, they will require a stringent and robust approach to selecting the right manufacturer and scrubber type, such as the structural assessments needed to undertake before choosing a system specific to each ship. 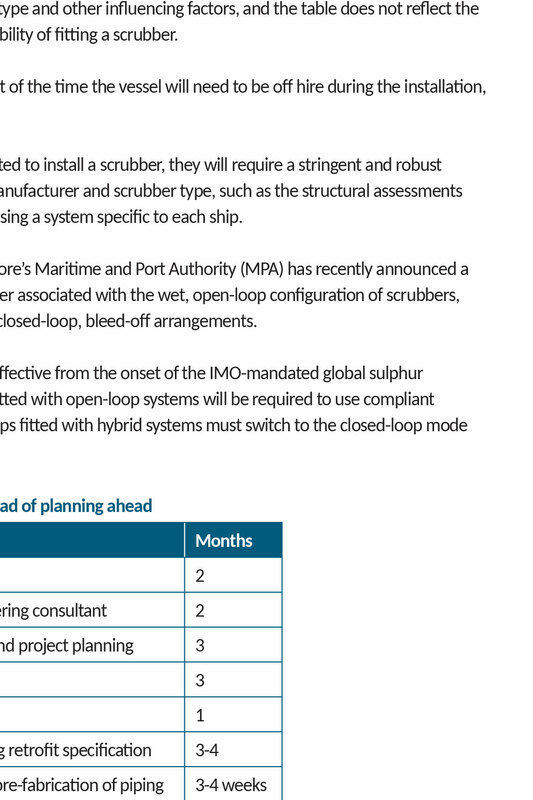 It is also worth noting that Singapore’s Maritime and Port Authority (MPA) has recently announced a ban on the discharge of wash water associated with the wet, open-loop configuration of scrubbers, including the discharge from any closed-loop, bleed-off arrangements. The ban will reportedly become effective from the onset of the IMO-mandated global sulphur limit on 1 January 2020. Vessels fitted with open-loop systems will be required to use compliant fuels in Singapore port waters; ships fitted with hybrid systems must switch to the closed-loop mode of operation. For shipowners or operators choosing to use compliant fuel, what are the key considerations you should be thinking about? By Mette Kronholm Frænde, Communications Manager and Editor at BIMCO Approximately 50% of the world fleet have little or no experience operating in an Emission Control Area Table 1 – Scrubbers: A lengthy road of planning ahead Process Months EGTS system selection 2 Selection of vendor and engineering consultant 2 On board survey: 3D scanning and project planning 3 Engineering analysis 3 Class approval 1 Shipyard selection and preparing retrofit specification 3-4 Production: shipping EGTS and pre-fabrication of piping 3-4 weeks Installation and commissioning 3-4 weeks Outside Emission Control Area (ECA) operations, the sulphur limit will result in an increase in fuel formulations being offered and there is uncertainty about the degree of diversity of these formulations. Therefore, shipowners and operators will need to consider what structural and procedural adjustments will need to be made on board. Whether that is considering loading a light product compared with a heavy one – and/or making greater efforts to segregate and avoid fuels mingling – industry experts warn against mixing one bunker with another, as there is a high risk of destabilising the fuels. In most situations, the crew cannot easily assess the degree of risk of this happening until the fuel is on board, making segregation of bunkers important. 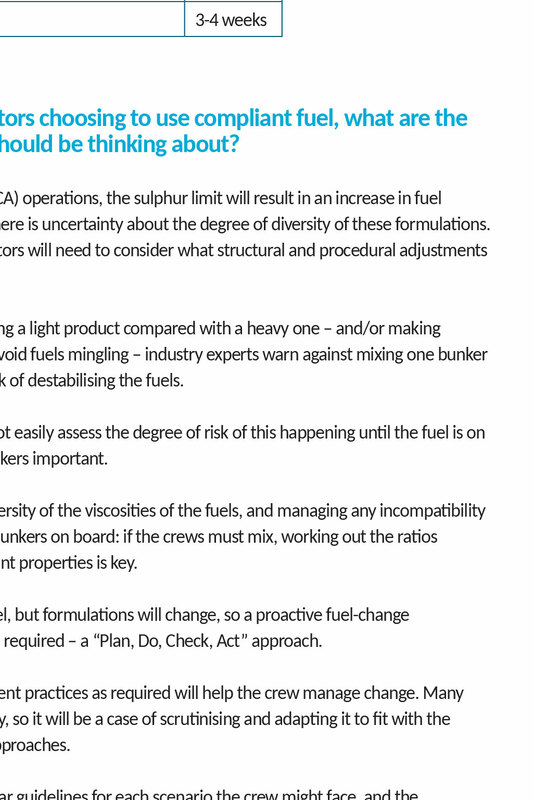 The next step is managing the diversity of the viscosities of the fuels, and managing any incompatibility observed between the different bunkers on board: if the crews must mix, working out the ratios involved and any potential resultant properties is key. 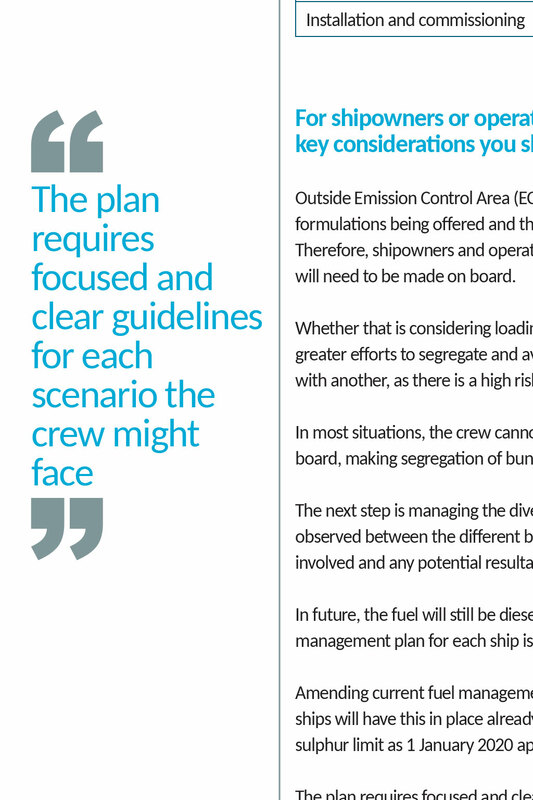 In future, the fuel will still be diesel, but formulations will change, so a proactive fuel-change management plan for each ship is required – a “Plan, Do, Check, Act” approach. Amending current fuel management practices as required will help the crew manage change. Many ships will have this in place already, so it will be a case of scrutinising and adapting it to fit with the sulphur limit as 1 January 2020 approaches. 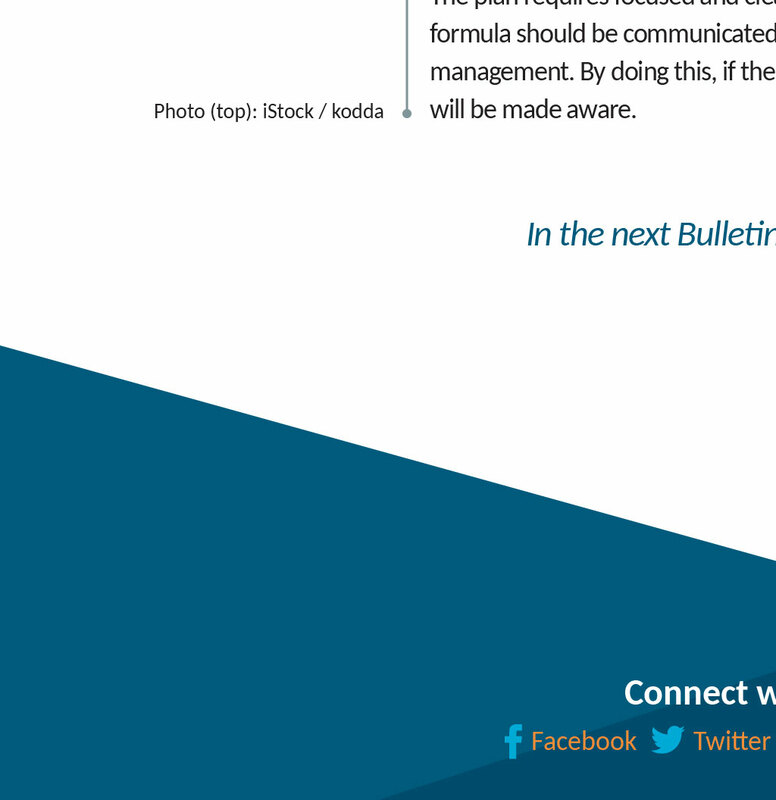 The plan requires focused and clear guidelines for each scenario the crew might face, and the formula should be communicated to the crew to raise awareness and build a relationship with the management. By doing this, if there are concerns about – or updates to – the plan, every stakeholder will be made aware. 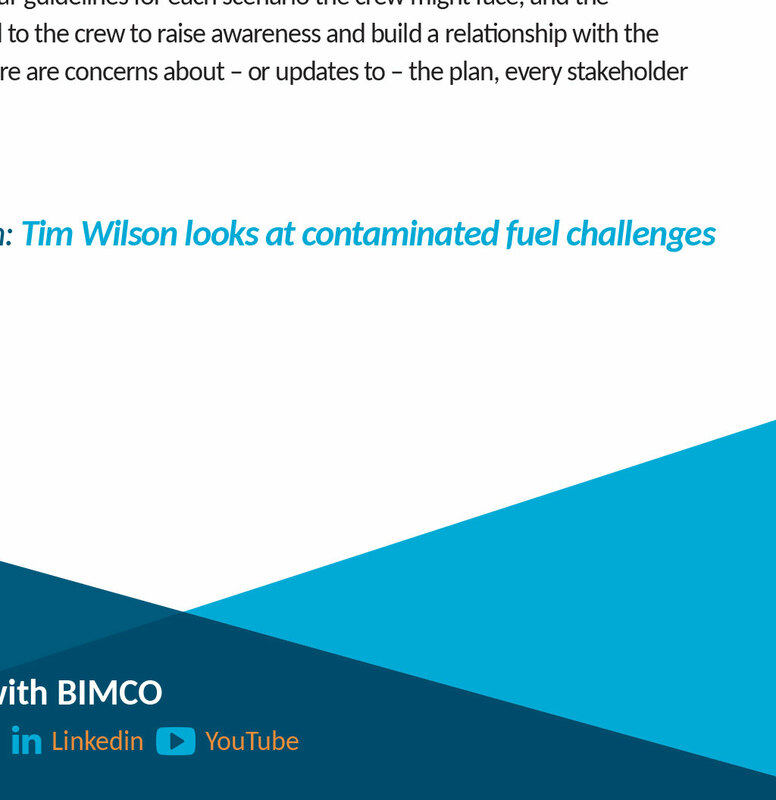 In the next Bulletin: Tim Wilson looks at contaminated fuel challenges Wilson’s career has spanned 44 years as a marine engineer with 20 years at sea and a further 22 years to date as consultant on marine fuels and exhaust emissions. He is a member of IBIA, CIMAC Fuels WG7 and the ISO TC 28/SC 4/WG 6. 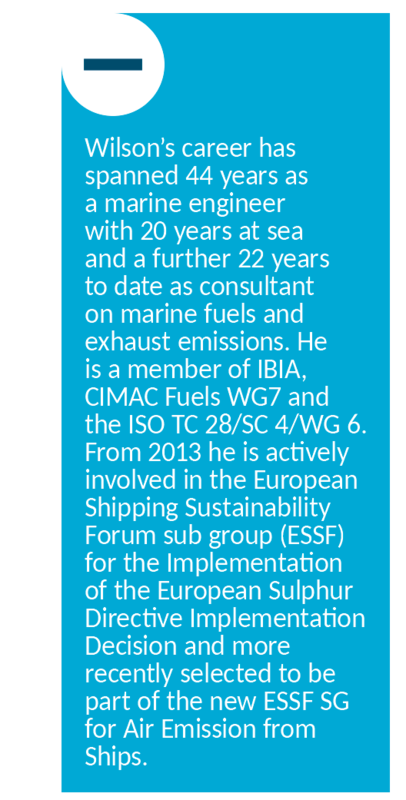 From 2013 he is actively involved in the European Shipping Sustainability Forum sub group (ESSF) for the Implementation of the European Sulphur Directive Implementation Decision and more recently selected to be part of the new ESSF SG for Air Emission from Ships.